Are you a high school student looking to get ahead on some of your college prerequisites? A college student looking for early afternoon classes? 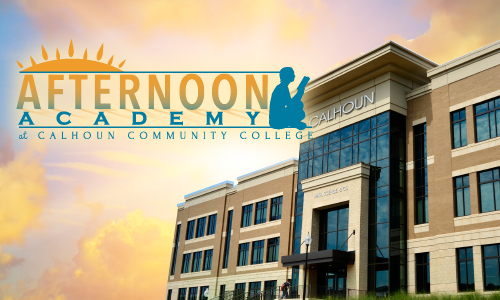 Check out Calhoun’s Afternoon Academy! Swing by Calhoun and fit in a college class or two – and still have time for sports, extra-curriculars, and your part-time jobs! Our successful Afternoon Academy is exclusively at our Huntsville campus in our new Math, Science, and CIS Building. This schedule of classes is designed so that students can take advantage of early release from high school and come to Calhoun in the afternoons to take introductory-level college courses; OR it’s perfect for traditional Calhoun students who want to build a two-day per week class schedule. We offer popular introductory-level courses s English, math, natural sciences, computer science, social science, and humanities. For more information and to register, please contact the Dual Enrollment Office.